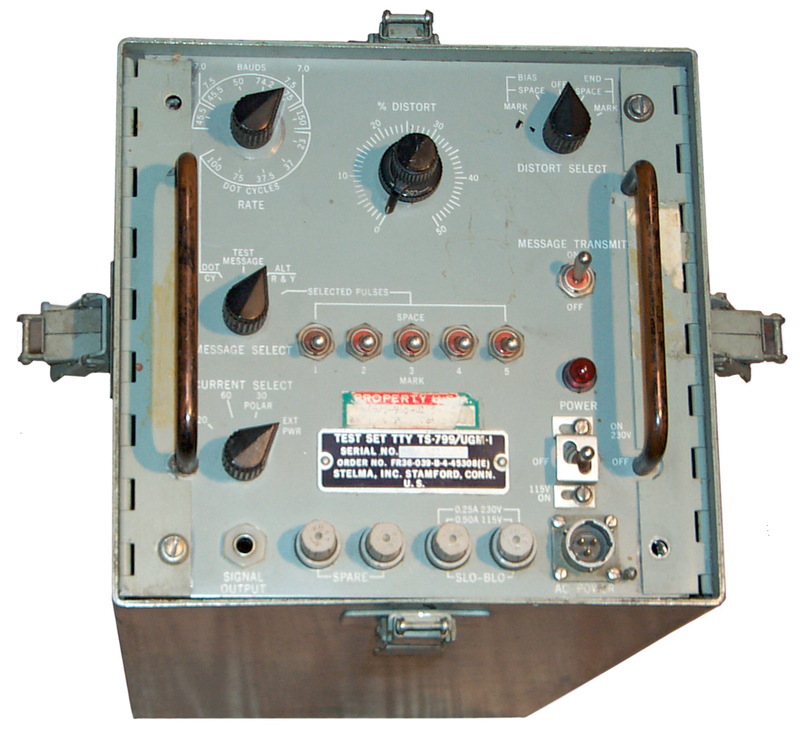 In order to test not only the actual teletypewriter but also the associated modulator - demodulator (modem aka. Data Converter) and/or the actual loop some type of data generator is needed. This test set is an all solid state design yet only has provision for 5 level code generation, not 5 and 8 bit. Also provision for some rather slow baud rates. The paint scheme is light gray. LOGSA has Technical Manuals but the -12 is not public accessable. My hope is to be able to use this to exercise the Western Union 5A Stock Quotation ticker machine. The test set chassis has covers on the top and bottom and then is inserted into the outer box which also has 5 faces. The front panel has a lot of filtering. Probably TEMPEST certified. is generated using discrete components, no ICs, no EEPROMS just resistors, capacitors, transistors and diodes! A 4 character call sign can be programmed at the end of the test message allowing the TS-799 to be connected to a transmitter for generating over the air Quick Brown Fox messages. Headquarters, Depatment of the Army, Washington D.C. Size . . . . . . . . . . . . . . . . . . . . . . . . . . . .8-23/32x17-1/8x8-7/16 in. (2) Types of distortion indicated. Types of distortion are total peak, early peak, late peak and average for mark-to-space or space-to-mark transitions. The percent distortion meter is a 250° front panel milliammeter calibrated 0% to 50% (±2%) with a 1 mA sensitivity at 53 millivolts. Meter resistance is 53 ohms. There is one EARLY indicator lamp and one LATE indicatorlamp. *This manual, together with TM 11-6625-620-20P, dated 28 February 1979, superxedes TM 11-6625-620-25P-3, dated 26 August 1976. Note the TS-836 uses +100 volt and -100 volt power supplies to drive the relays. There are two ranges on the switch. The top range is the baud rate slection. The bottom range is the dot cycles slection. The front panel power switch is a center off, up for 230 VAC on and down for 115 VAC on with a metal gate (like a Ferrari transmission) where the gate can be positioned for either 115 or 230 volt operation. A MO C7A neon bulb is behind the red plastic pilot light lens. Dual fuses and spares mounted on the front panel. A ¼" insulated phone jack is used for the output. 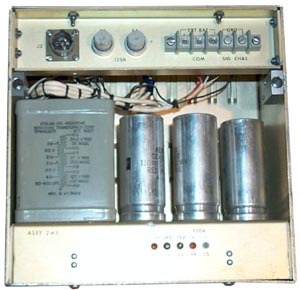 In order to have Polar output two external floating power supplies need to be connected to TB1. Positive External Battery to terminal 1. External Battery Common to terminal 2. Negative External Battery to terminal 3. Terminal 4 is Signal ground. Terminal 5 is Chassis ground. J2 is a MS 3112E 12-3P Same connector as front panel AC so probably for AC input, but why? Maybe the TS-799 and TS-800 can be fitted into a single outer box and the AC is daily chained? F3 & F4 are 0.125 Amp fuses, maybe in the TTY loop. In addition to the front panel there is 2A1A1 PCB that's related to the front panel with 3 ea 2N1305 transistors and 12 ea caps selected at test. 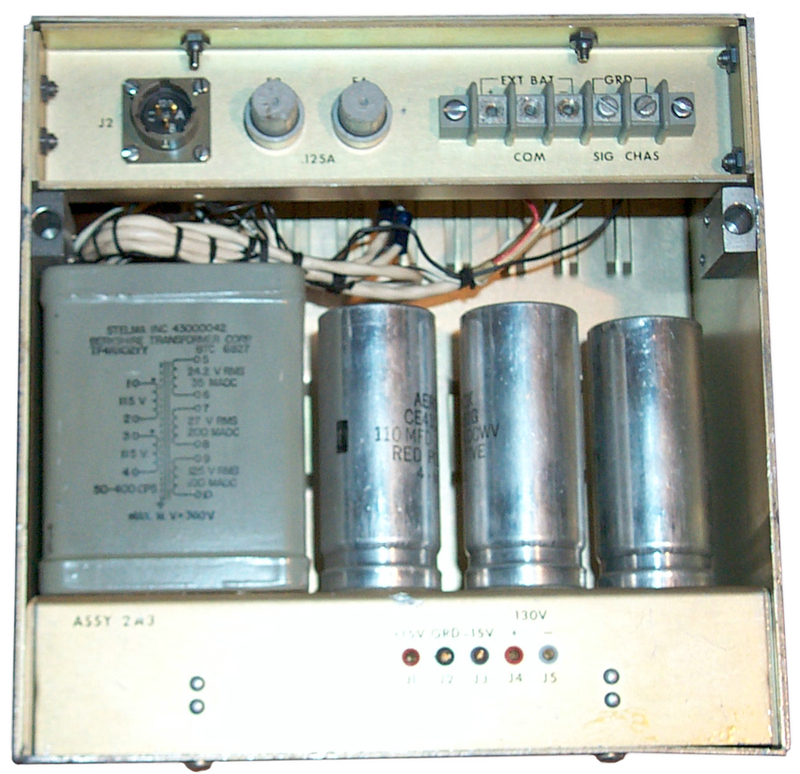 The power supply box has PCB 2A3A1 shown photo left, instrument rear.. There are 19 plug-in printed circuit boards. page created 7 Sep 2007.